It’s not a high fat world any more than it’s a vegetarian country. A better description might be: “Doctors and nutritionists, alarmed by the reduction in funding for anything but the party line, and imbued with a missionary zeal, try hard to find something wrong with meat, especially red meat.” A lifeline for bloggers: there is a “meat kills” article every couple of months, usually an epidemiologic study with an odds ratio of 1.4. Odds ratio is what it sounds like: Your odds of getting a disease with the intervention vs your odds under control conditions. These relative risk indicators are commonly around 1.4 for the usual “is associated with” article. For comparison, the odds ratio for getting lung cancer if you smoke is about 20 compared to not smoking. If you are a heavy smoker, odds are about 30 to 1. A little elementary algebra will tell you that odds ratio of 1.4 comes out around 60:40 distribution for getting better with meat or getting worse with meat. That’s what it means. Statistically, you are looking at a two-tailed distribution. That means that if you don’t get better, you will get worse. Without other knowledge, more meat may be better. Not compelling odds to me. Since we don’t really know what causes cancer or even heart disease or especially all-cause mortality, most of us let the “meat will kill you stories” fade into oblivion like other “breaking” news stories. However, when the dictum is “meat causes diabetes,” it is hard to ignore. Far-fetched and dangerous for it’s obscuring the elephant in the room, carbohydrate, such a preposterous notion should be addressed. You have to read the original in order to properly evaluate papers like this. First off, as in much of the medical literature, you see only one figure but several mind-numbing tables. Masses of numbers instead of graphics is a sufficiently serious problem that a whole book, “Medical Illuminations” (recommended), has been written about it. The tables, however, do give you the raw data (at least as averaged into big groups) and the outcome from “corrected models.” Without going through the calculation here, the tables tell you how many people from each group (broken up by meat consumption) have diabetes. Divide the number of cases by number in the group and you can see the risk. When you plot the raw data you see that the reduction in red meat intake, which is really the ultimate recommendation of the paper, leads to an increase in diabetes. What? That’s the opposite of the authors’ conclusion. The raw data is in the tables but the authors do not calculate the risk from that data. You have to do that yourself. It is just arithmetic but it seems like the authors would tell you. The table shows results from “models” that have been “corrected” for confounders. What does that mean? Well, when you get a positive result for an association, you have to make sure that there weren’t underlying factors (other than the one you are interested in) that account for the outcome. So, for example, if you say that increase in a particular food is associated with a disease, you are expected to subtract out the effect of any increased calories. On the other hand, if your primary data don’t show an effect then you are, more or less, out of luck. You can try, however, to “correct” with something known to cause the disease, something expected to make things worse. If this makes things better, you may have shown a benefit in your outcome but it becomes very far-fetched unless there is a very small number of variables. Generally, if your “confounders” improve the correlation, it is likely that it is the confounders that are the controlling variables. 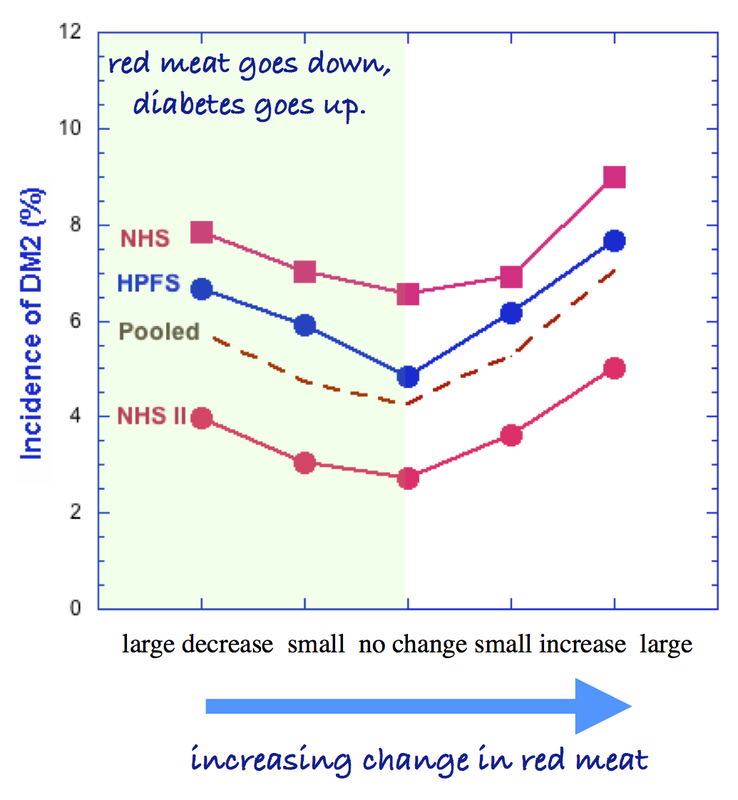 “Figure 1 in our article1 showed that increasing red meat intake within a 4-year period was positively associated with T2DM in the subsequent 4 years in a dose responsive manner, not “the effect of reducing meat consumption, which increased the frequency of diabetes in all the cohorts studied,” as claimed by Dr Feinman. So how do they justify their conclusion? Simple, they correct the data for confounders. 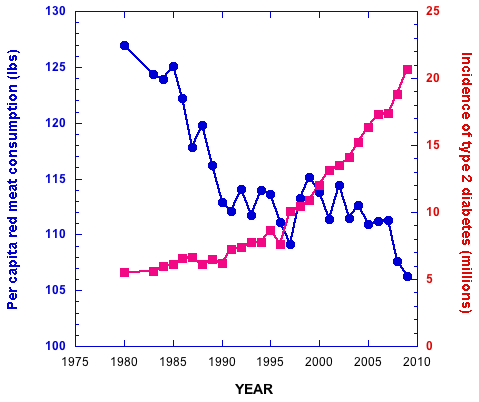 They correct for initial red meat intake which makes the effect of an increase in meat stronger as you would expect. They then correct for age but they don’t show you what that effect is. In fact, they correct for “race, marital status, family history of T2DM, history of hypertension, history of hypercholesterolemia, smoking status, initial and changes in alcohol intake,…” — I’m not making this up — “physical activity, total energy intake, diet quality, postmenopausal status and menopausal hormone use plus initial body mass index and weight change.” Mirabile dictu, they are able to get the answer to come out the way they want. This statement stands as the embodiment of the total lack of common sense and the irrational perspective of the epidemiologist. (Okay. Just these epidemiologists ). Epidemiology is not more sophisticated than ecology and the data are epidemiologic any way. And there are always more factors. You have to say what the factors are. You can’t just say something else might be involved. The end of common sense. The end of science. But why do they do this? I am not sure why you would think that red meat had much to do with diabetes but the study showed that, if you did, you would be wrong. Research gives you a lot of failures. You just go on to something else. Nobody knows about motivation, nobody knows what was on their mind. Seven possible reasons are NIH grants P01CA087969, R01CA050385, U19CA055075, R01DK058845, P30DK046200, U54CA155626 and K99HL098459. Nonetheless, one has the sense that the authors really believe their conclusion and that there is a general emotional and puritanical reaction to red meat and its agents. This list is notable for the presence of saturated fat and cholesterol. Isn’t that dead? The latest report about evidence that saturated fat does not pose a risk has a certain degree of squabbling but it is only one in a long line of individual studies and meta-analyses that drive a stake through the heart of cholesterol and saturated fat as a risk. Walter Willett, an author on Pan, et al just couldn’t face the result and wanted the paper withdrawn, but the history of risk of saturated fat and cholesterol is demonstration of one failure after another, some from his own lab. The idea never dies. One interesting part of the squabbling was the statement, “A 2009 review concluded that replacing saturated fats with carbohydrates had no benefit, while replacing them with polyunsaturated fats reduced the risk of heart disease. Several scientists say that should have been mentioned in the new paper.” Presumably it is the second part, rather than the first that they want mentioned. But underneath it all is the moralistic, puritanical mindset. In trying to face the evidence in the original report, Alice Lichtenstein said, “It would be unfortunate if these results were interpreted to suggest that people can go back to eating butter and cheese with abandon.” Abandon? I guess we are supposed to think of the gutted pig scene in Fellini’s Satyricon. All such moralistic proscriptions have the risk of what pyschologists call counter-control, where people specifically do the opposite to what they are told because they don’t like to be pushed around. I personally rarely eat meat before 6 PM, but when I found out that Mark Bittman says that that is what we all must do, it made me get out left-over spareribs for lunch. Now going back to the original question of Carrot Nation, it is heartening to see that in her review of Deborah Madison’s Vegetable Literacy, Kramer points out that, in the preparation of cardoon risotto “there is permission to simmer it in a ‘light chicken stock,’ and even an acknowledgement that vegetable stock might ‘overwhelm’ the flavor of that delicately bitter member of the sunflower family.…” And, in the end, Kramer says, “The book is sly. Think of it as a pro-choice cookbook decorously wrapped in carrots and beans and lettuce leaves. Apart from the chicken broth, you won’t find anything ‘animal’ listed but read what she has to say about some of those recipes, and you will detect the beginning of a stealth operation — a call to sit down at the dinner table together and put an end to the testy herbivore-carnivore divide.” This suggests that they might both be in tune with my own philosophy. I am not arguing for meat but rather I am opposed to inaccurately attacking meat, a philosophy that I call antidiscarnivorianism. Thanks. My statistical skills are minimal but statistics has to stand up to common sense and mechanism comes first. Its good that you are debunking scientific papers but your post on sugar is accusing conflict of interest which is not appropriate. I may have overdone it myself in citing how many grants Pan, et al. have but I am sure they really believe in what they are doing. Before you go off on fructose, you might check out my analysis: http://www.nutritionandmetabolism.com/content/pdf/1743-7075-10-45.pdf. Richard–Your article on fructose is very well thought out, although the chemistry is a bit beyond my pay grade. I sent it along to my fructose friends, Richard Johnson and Robert Lustig. It will be interesting to hear their response. I look forward to their comments. There is one question to ask them (and anybody else). If you have a patient with metabolic syndrome (or anybody really), on average, which is most likely to help: Replace carbohydrate, any carbohydrate, with fat, any fat (no trans-fat) -OR- Replace fructose with glucose, sugar with starch, e.g. ? Ignore subtleties. Just those two choices. Richard–This is a “no brainer”. Of course fat wins every time. I am a big fan of ketogenic diets. I generally consume almost no grains and get most of my carbohydrates from vegetables and some fruit. I am married to a wonderful Greek lady so if she makes baklava, for the sake of marital harmony I will have a piece or two. If you are going to eat sugar or starch, make sure it’s the good stuff and don’t do it very often. If you haven’t read it, Thomas Seyfried’s book “Cancer as a Metabolic Disease” is quite good. He is a local Boston boy. Baklava goes beyond marital harmony but a lot of us have to have very small amounts. I am not unaware of Johnson’s work. I will respond in detail to both of you in a day or so. The polyol pathway, which I think is what he is referring to, is not like gluconeogenesis (and is not sensibly called fructoneogenesis). I simply feel that as he has published it, it is speculative. I have not looked at it recently but my recollection is that he had a well-done indirect study but not a simple direct tracer study. Glad to see a new post! I want to make sure I understand what was done to get a positive result between red meat and diabetes. They added corrections for factors like age, race, marital status, family history, etc., and that would ordinarily sound like a good thing. Is it because the alleged corrections were in fact distortions, and if so, how do you know? If it’s because of the negative correlation between red meat and diabetes prior to “correcting” the other factors, why couldn’t they claim that the negative result is wrong because of confounders? It is a matter of perspective. We are talking about risk of a very serious disease and a proposed cause that is what many of us eat frequently. With no indication of what we should substitute for red meat, we are supposed to be afraid of it as if it were a toxin. Given that, we expect clear evidence of risk. Big evidence. Given the real epidemiologic (ecologic, if you like) evidence, that in the whole population, there was a negative correlation, we expect a knock-out result and clear scientific explanation of why it is so at odds with the population data and primary biochemistry: carbohydrates not protein are the major factor in diabetes. Not something that at a gross level goes the wrong way and has to be extensively manipulated. The answer to your last question, the authors can claim whatever they want. They have extremely poor data with low effects size. Most of the Hazard Ratios would not be accepted in a legal toxic tort case. The authors could claim whatever they want. I was kind to this study. It is meaningless. In this field, real peer review is actually rare. RDF: Don’t you think that giving carbohydrates to people with diabetes is one of the worst scandals in the history of medicine? Jessica A. Feinman, MD: Remember, Dad, I’m a psychiatrist. We used to treat patients by sticking an ice-pick in their brain. Richard–There are times when the old ice pick treatment might seem appropriate! For the doctor or the patient? Terrific article. I’m putting it on Linked In. James Kenny is still following and attacking everything I post, so this should be good bait for him to chew on! Tu es tres gentille. Good luck on LinkedIn. Yes I too have tangled with James. I don’t think he will ever change his perspective. I think he probably has a good diet for himself but, like Carrot Nation, his problem is he wants us all to live like that. I’d rather eat fat with abandon. Would love come for breakfast. That’s were evolutionary biology comes into play. I don’t think it is wise to stray too far from the diet that humans evolved eating. Although that diet likely varied a great deal, we do know it didn’t contain any Twinkies! What’s the main ingredient in Twinkies? Answer at the end of http://wp.me/p16vK0-6W. Richard–I sense that you are a true curmudgeon–and I say that as a complement. Your point about Twinkies and Pop Tarts is well taken. Taken as a compliment. I suspect that coming upon a bush of berries for our ancestors was a little like finding a coupon for Haagen-Dasz. I doubt that moderation was the response. We likely evolved to deal with sudden good times. Abandon is 2nd from right, facing, & I’m sure she has the manners to have the Pont l’Eveque before the Byzantine Delight. While Fellini-style Satyricon is one answer, LennyBruce verbal satire would be better, particularly if accompanied by music, Tom Lehrer mode. Thanks for this. It it is spam, it is certainly sophisticated spam. but the likelihood on the evidence is that the (small) benefit in the second part was due to extra intake of omega 3 and had nothing to do with SFA, because there was no benefit to lowering SFA in any other way. Even so there was no reduction in total mortality. Wherever most of the people in a place eat a similar type of diet, those who are eating more omega 3 also tend to eat more SFA (or vice versa) and have lower CVD rates. e.g. Koh et al 2013. But this may be because people who eat more fat tend to eat less carbohydrate. The first question is: is there risk from Saturated Fat? There are now dozens of studies that say no. The meta-analyses that show differences have very small numbers and do not explain how you can average a bunch of studies that failed and come up with a risk. That’s why my favorite breakfast is bacon and eggs with olive oil poured over the eggs. For dinner I’m thinking about grass-fed beef topped with butter with some veggies on the side. I guess you could call me a fat head! “may be” is marginally less dogmatic than “compelling” as it logically includes “may not be”. More than marginally. As generally used — saying “may cause” constitutes making a statement while allowing yourself to back out — it is meaningless or worse. How I would read the BCAA theory, and any meat-diabetes stats that did stay robust, were there ever such a thing; the diet that causes metabolic syndrome can, at its extreme expression, reverse the protective effect of higher intake of protein, somewhat. That would not be implausible, but does not imply any “fault” of protein; a similar thing occurs with DHA at high sugar intakes. Also, the accumulation of C3 and C5 from BCAA mentioned in the Bremer-Lustig paper would be a result of defective B12 metabolism, not of fatty-acid oxidation priorities. Observational study of one: It is possible, over the course of less than a year, to bring an A1C down from 9.6 to 6.8 (so far), without increasing a modest dose of a diabetes drug, but using a diet that includes plenty of red meat, butter, eggs, full fat milk, cheese, etc., and limits carbohydrates to approximately 80 grams per day. So simple and painless. Oh, yes. If one worries about such things, “cholesterol” has gone from mid-200s to 160. I’m sorry, Marilyn. You are not alone. Eric Westman and Will Yancy have several folks with similar stories and Mary Vernon gets worse cases which she brings around. Sic transit gloria mundi but I congratulate you on your success. Oh, yes, Richard. I know I’m not alone. I’ve read and reread the words of these wonderful people you mentioned. Just thought I’d chime in and share my experience. My “study” was based on Lutz/Allen’s “Life Without Bread” — specifically the bread units idea. As “dietitian,” I set up a daily template that included seven bread units–about 84 grams of carbohydrate. There are no proscribed foods. My “client’s” beloved white bread, jam, chocolate, etc. are included, but in smaller amounts. A couple of favorite foods are now made with substitute sweeteners. Since I am also the “kitchen,” I make up a lot of four-bread-unit recipes. But I don’t carefully measure out individual servings. I put the baking dish on the table and we each eat what we want. There’s always enough left over for a second meal. I don’t put water in scrambled eggs. I use whole milk. And so on. Yet with all this lack of rigor, the results I mentioned above have been achieved. I realize that all this would be more complicated in a household of more people, but I’ve often thought what a tragedy it is that something that has worked so simply for us can’t at least–as you have often said–be suggested to people to TRY. For us, a low-carb diet has been neither “too difficult” nor “dangerous”! Marilyn–You should see the food they feed people with diabetes at the hospitals where I work. It’s enough to make a grown man cry! The idea of “counting” carbohydrates and then adjusting insulin or medication is very foolish indeed. Can anyone say “dog chasing tail”? Diabetes is a disease of carbohydrates so they must be limited to improve. It’s too bad the medical profession has by and large ignored this simple fact. In the hospital, it’s eat-that-100%-carbohydrate-breakfast or die of starvation. I’m guessing that if a hospital receives any government funding, they are required to serve “politically correct” meals. Not good. Everybody reports this but I guess few of us complain to the hospital. But maybe not too late. What if your A1C is 5.2 and you eat fruit, potatoes, rice everyday along with meat, full fat dairy, 1 hard boiled egg, nuts, seeds, veggies, etc? It depends who you are. A1c, that is, glucose, is regulated unless things go wrong. Charles–I agree with Richard. Some folks can eat these types of carbs without obvious problems. Genetics likely plays a role. Paul Jaminet is the champion of “safe carbohydrates” but it is a controversial concept. By the way, nobody that I know of considers wheat to be a safe carbohydrate. @docww – define what % some folks means. Charles–I don’t have any established statistics in this regard but it’s more based on observing thousands of patients over many years. When I lived in Northern Minnesota there were a lot of Native Americans. Once they started to eat our food they became metabolic disasters in a short period of time. For others with a different genetic background it might take decades for these metabolic changes to occur. It’s worth pointing out that every single champion of :”safe starches”, resistant starch, and so on on the internet is someone who went low-carb for a while before discovering this. Some perhaps had normal glycemic control to start with, but it’s likely that the others regained theirs through the low-carb transition;(or if inflammation or autoimmunity was the issue instead, reversed that) then found some low-GI starches “safe” in the context of a high-fat diet. This would not have surprised Doctor Atkins. I would say epigenetics is a more likely explanation. We are not all different species. or plain old Mendelian genetics. We are bit different species but Jack Spratt did not marry his cousin. Carrot nation/Carrie Nation. Clever title, nice article. I would love to get the book mentioned in the post “Cancer as a Metabolic Disease” but at $150.00 delivery to Australia its a joke.And a Kindle price of $111.00…is insane. Seyfried has written a lot of things and you can probably find a lot on the internet for nothing. Thanks..It wasnt about finding things “for nothing”..and you can agree with anyone you like…but it doesn’t negate what I have said or the facts in the slightest… possibly the most expensive downloadable book on Amazon isn’t something to be proud of..
Dr. Feinman, do you have a statistics text you would recommend for Molecular Biology student such as myself? I think there is no doubt that in “Westernized” populations, low-toxin/low-immunogenic low-carbohydrate diets based on simple evolutionary principles is a logical and reasonable starting point. What I am fascinated with is trying to reconcile that, with the observation that an indisputably healthy population eating like then Kitavans eat a very high carbohydrate diet – if we can figure them out, we’ll likely have excluded some bad ideas and uncovered some co-variables to total carbohydrate intake. This would greatly help the current level of discussion regarding carbohydrate intake which is somewhat circular at this point (not on this blog, of course!). I am surprised no one (that I know of) is trying to reconcile this contradictory information (LC = generally better in modern civilizations vs high-carb is also “fine” in traditional/HG populations). It seems such an obvious scientific cherry to reach for. I am not an expert on statistics. Most of the problems in the literature are problems in common sense. I don’t like any of the statistics texts. For relatively relaxed approach, PDQ Statistics is good but expensive. For serious (and free), you can download David Colquhoun’s Lectures on Biostatistics from his website http://www.dcscience.net. There are also numerous sources on the internet. On your general question, you don’t have to go to Kitava to find people who do well on low-fat diets. What the data clearly show is that for therapy of diabetes and metabolic syndrome, low-carb is your best-bet by far. And nothing is better for weight loss. It may even be better for the Kitavans if they do get sick. I think that is all we know for sure. In terms of prevention, it would be surprising if carbohydrate weren’t involved in some way but we really don’t know what the factors are. The remarkable thing is that so many people fall into any one group (best treated with low-carb), not that people are different. The big error in medicine — part of the job — is confusing working with limited knowledge and random evidence and real solid scientific knowledge. And there are not only individual differences but it would not be surprising if local or inbred populations had their own response to diet that was different from others. Kitava is an island, isn’t it? I am not buying the idea that the Kitavans eat a tremendously high carbohydrate diet unless I meet them myself and somehow scientifically analyze what they eat. I’ve seen too many examples of white Americans looking at some other culture and misanalyzing their diet. Two examples: “Mediterranean diet” (whatever that is–the lands around that sea are a BIG region, with lots of cultures extant) and “Okinawan diet”. Both these groups are written off as mostly vegetarian and I know someone who is Japanese who has told me that Okinawans, for their part, are inordinately fond of pork and lard. Last I checked pig isn’t a vegetable. That said, I think that people who live on volcanic islands have an advantage most of us don’t have, to wit, they live on high-sulfur soil. Dr. Stephanie Seneff has done some interesting work about this. I found her years ago on a Google search after researching (of all things) keratosis pilaris, discovering that sulfur seems to play a role in that disorder, remembering that mine got worse as I got fatter and then wondering if sulfur had anything to do with insulin. Turns out the molecule contains some considerable amount of sulfur (it’s a peptide, or a protein fragment) and Dr. Seneff filled in some of the rest. Getting fat is often paired with going diabetic. Going diabetic (for type 2s) involves making ever more insulin. That’s going to burn up your sulfur supply with a quickness, and if you don’t have as much available, you’re not going to be able to make all that insulin forever. Someone living on a volcano has got more sulfur in their food by default. Takes them longer to run low. Though you still find fat people eating high-carb diets on volcanic islands. Dr. Seneff’s ideas about sulfated vitamin D and sulfated cholesterol are interesting too. Sulfated vitamin D, for one, has to be made in the skin. As far as I know, no one makes it as a supplement. Guess what most island people get a lot of in addition to sulfur? Sunlight, of course. If you don’t get a lot of sulfur in your diet and don’t get a lot of sun (if you’re living north of South Carolina, in fact, it doesn’t matter if you get a lot of sun–the light angle is different and you make less D) then don’t try to eat like a Kitavan even if the pro-carb Paleo folks are right about them. You aren’t well-equipped to dispense of the by-products. I agree that ideas about what people eat may be mostly ideas. The Mediterranean diet is different that what I eat when I am in the Mediterranean. I don’t know about sulfur but there are different people and different populations and if they are in-bred they are likely to appear homogeneous. Kitava is an island, isn’t it? “or if inflammation or autoimmunity was the issue instead” —> I think you hit nail on the head. The variables necessarily accompanying macronutrient changes are preferentially overlooked as considering them renders the task of diagnosis and experimentation that more complex. If all you have is hammer, then the world looks like it’s full of nails. Thank you very much for the link & suggestion – I really do not want to get caught out due to misapplied basics statistics (especially in the age of computing!). “The big error in medicine — part of the job — is confusing working with limited knowledge and random evidence and real solid scientific knowledge” —> I wholeheartedly agree and is precisely the reason why I am so fascinated with attempting to resolve those *apparent* contradictions. Yes, Kitava is an island. As you know, equivalent examples also exist outside of it. You raise an interesting point: “it would not be surprising if local or inbred populations had their own response to diet that was different from others” —> from my studies and understanding of genetics it seems like chromatin/histone deacetylase based epigenetic modulatory mechanisms certainly explain meaningful changes to amylase copies, phase variations of the Lac operon and other such ‘superficial’ changes….but for more fundamental changes to take place, like which mitochondrial complexes we ‘favor’ in the long run, much stronger evolutionary pressures and longer time periods seem necessary. My introductory statistics (ecology) professor said Rule One of statistical analysis was “FIRST ALWAYS GRAPH YOUR DATA”, so I appreciate you making the same point, and the reference to the book Medical Illuminations. Good stuff! I found this interesting. Maybe there’s hope?? There’s definitely hope and Nina Teicholz’s book to be released this month will help. Compared with participants in the bottom quartile, participants who were in the highest quartile of refined grain intake were significantly more likely to have the metabolic syndrome (odds ratio, 7.83; 95% confidence interval, 4.72-12.99). Higher intake of refined grains was associated with insulin resistance and the metabolic syndrome in this population of Asian Indians who habitually consume high-carbohydrate diets. Looking at a similar Korean paper with much lower OR, it seems a bit of meat and dairy in the diet goes a long way to reducing this effect: someone ought to tell Pan. What did the uncorrected data look like? This kind of epidemiology does not do much for me. pounds he gained during his residency. He’s confused and he’s not helping the larger debate. He is what they call in mathematics, a singularity. As to the rest of the post – going into my list of faves for kicking the crap out of applying epidemiological fantasy findings to media headlines. After all this time they’re still trying to find an angle whereby saturated fat seems like a bad thing – and failing miserably. Thanks for the link. I think that quite a few things need to change. Ash–As I tell my patients, a vegan diet is likely better than the Standard American Diet, although not by much. Neither will bring you health and happiness. If you really want to be healthy you need to avoid both. Go Atkins, Paleo or ketogenic–it’s not rocket science but it is science. Love the post, thanks for doing what you do… it’s a real breath of fresh air and makes sense of the non sense! Thanks Richard for your intelligent analysis. Makes me wonder also if the same kind of mis-research regarding meat eaters also exists implicating vegetables in strict vegetarians as the cause of diabetes? If eating meat is suspect, so would vegetables! Why would a lifelong vegetarian also become diabetic late in life? Organic vegetable carbohydrates cause organic diabetes! I am not sure what you are saying. Is somebody saying that lifelong vegetarian is risk for diabetes? I mean, I know that there is somebody saying every possible thing but I don’t think that is what anybody reasonable is saying. The bottom line is that we don’t know what causes diabetes. The positive effects of low carbohydrate as a treatment suggests that high carbohydrate could be a risk factor for some people but we don’t know that. I am certainly not opposed to vegetarian diet — not good for me or my family — but only the people who want to insist on it for everybody. And, again, as in the blogpost, I am only opposed to the opposition to red meat. The philosophy is only antidiscarnivoriansim.